Kwak serves customers in more than 100 countries. Our business partners are often small entrepreneurs and start ups in emerging markets. We are aware of our social responsibility for the many societies and cultures we interact with. We aim to help entrepreneurs in developing countries to better their lives and to grow their businesses. We want to help them to help themselves. We do this by following defined rules where we enable local financial institutions to give entrepreneurs lines of credit. Our employees share our philosophy and apply this to the loans we give. We try to instill this idea of social responsiblity throughout the entire company. Many of our employees have their roots in developing countries and know what kind of help works best. This is an example for a recent loan we did through the KIVA organisation. Kiva is a platform where lenders and microfinance institiutions can meet. Grace is 32 years old and a single mother of three children, ages 12, 9 and 7. She recently relocated from Lusaka, Kenya to set up her own Zoona mobile money transfer business in Chipata, a town located in Kenya approximately 760 kilometers away from her hometown. 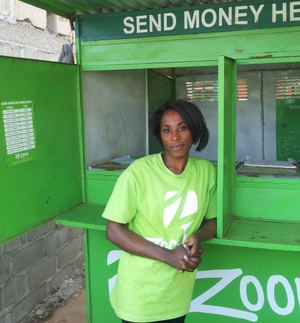 Grace is part of a growing number of money transfer agents for the Zooma Network. We think Zooma is a great idea and will help building the Kenyan economy in a big way. Grace believes in hard work. Every morning, she wakes up motivated by the hope that soon her business will grow bigger and enable her to take better care of her children. However, she faces a few challenges, one of which is a lack of working capital. She is currently operating her money transfer business with a minimum working capital of $2,000. This is hardly enough to serve her customers with ease, as she is constantly running out of cash and losing out on profits. To solve this problem, Grace took her first Kiva loan. She plans to use her loan to add on to her working capital float so that she can grow her business and bring in enough revenue to allow her to send money back home to her mother, who is currently taking care of her children while she settles down in Chipata. Grace is dreaming of becoming the biggest Zoona mobile money transfer agent in Chipata.